Links Broadcast an SCCI Alphatrack broadcast facility, has been providing a secure end-to-end service for live event cinema and recorded content such as the opera, ballet, concerts, red carpet events and major sporting fixtures to digital cinema since 2007. 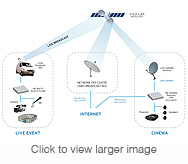 Links Broadcast’s own fleet of satellite uplink vehicles broadcast encrypted content via satellite around the world. Our own technicians provide and install our cost effective 1.2m satellite antenna and HD digital satellite receiver with encryption at each cinema location. Our event cinema satellite receivers are remotely manageable via our network operations centre located in Harlow, allowing for receiver parameters and encryption keys to be entered securely without the need for technical staff in the cinema locations. Our helpdesk is available for support on technical issues and provides a nationwide on-site repair service via our regionally based service technicians. Links Broadcast provide a tried and tested turnkey live cinema events service to content providers, distributers and UK exhibitors/cinemas.